The Gua sha Certification Course provides a practitioner with both the didactic and direct hands-on teaching necessary for the safe and effective practice of Gua sha. While the Gua sha book and DVD are essential background, research and reference for a competent Gua sha practitioner, Gua sha has always been taught person to person. The Certification Course offers participants a supervised level of training that qualifies safe and effective practice. The Course teaches background including history, research evidence, how to apply, how to use clinically and in specific disorders, how to assess changes based on symptoms and sha quality and color, and immediate Tongue changes with cases from practice. There has never been a more complete and in-depth teaching of this therapeutic technique. Each subject area (listed below) is covered in an online module lecture through Pro D Seminars. Participation requires watching the video, reading any assignments and then completing assessment tools and quiz questions to test knowledge base. Completion of all 11 modules plus a hands-on assessment with Dr. Nielsen is required for Certification*. Each individual module is approved for CEU/PDA/CPD by NCCAOM, California, Florida, Texas, Canada, AACMA (Australia) and NZRA (New Zealand). The total credit for all 11 modules is 50 CEU/PDA/CPDs. * Candidates are required to take an in person practicum, hands-on seminar with Dr. Nielsen to assess Gua sha technique, treatment of specific areas of the body, pediatric applications and special techniques. The Science of Gua sha may be viewed for free on ProD Medigogy. If a viewer would like NCCAOM biomedical PDA credit for this module after viewing, they can sign up and compensate ProD as well as take the assessment tools and quiz required for PDA award. Any of the modules can be purchased separately without doing the whole course. All of the modules are required for the Certification Course as well as the in person practicum. What does Gua sha Certificate give me? Certification confirms a basic knowledge of Gua sha, its safe application and use in clinical practice. The course also deepens a practitioner’s knowledge of the science of and evidence for traditional East Asian medicine generally and Gua sha specifically. How the technique works focuses our clinical skill in terms of when to apply Gua sha, and the nature of its unique and essential healing effect in acute but also in chronic organ disease. Research shows Gua sha upregulates HO-1 which itself has been shown to be anti-inflammatory and immune protective but also mitigates viral replication in illnesses such as viral hepatitis and influenza making Gua sha a critical option for acute and chronic viral illness. Safe procedure, proper tools and effective Gua sha technique is learned for specific clinical presentations. Your technique will be assessed by Dr. Nielsen. Practitioners who complete the course will receive a Course Certificate and be listed on guasha.com as a Gua sha practitioner with potential patient referals. Ongoing mentorship may be elected as an option through ProD Seminars. What if I have taken a few modules already and now I want to sign up for the whole Certification Course? You can upgrade to take the complete program, all 11 modules, and apply the cost of the individual modules to the cost of the full course. You save money because collectively the 11 module program costs less than the individual modules if taken separately. Contact ProD Seminars directly and they will apply the fees you have paid to the fee of the full 11 module Gua sha Certification Course. How long do I have to complete the Gua sha Certification Course? You are given access to the modules for 2 years from registration date. The coursework can be completed at your own pace over the two years. You can watch and review your modules as often and as many times as you like in that 2 year period. How do I get email updates? 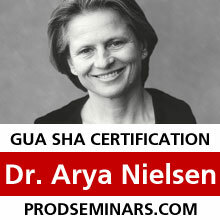 Let us know you are interested in the Gua sha Certification Course taught by Dr. Arya Nielsen by signing up below. If you are interested in learning more about upcoming Gua sha courses, please fill out the form below. Enter Information Below to Receive Updates.